On the final day of the year, Chubby Botak Koala and Little Devil decided to present to our beloved readers our highlights this year. OSIA Bar & Restaurant definitely worth considering if you are celebrating a special occasion. Beautiful service, ambiance and good selection of food. With open kitchen concept, you can view Chef Douglas Tay running the kitchen and serving those fine dining dishes for you to savour. We also finally review our favourite Korean Restaurant, Guiga Korean BBQ Restaurant. It serve a good all round quality Korean food at reasonable price. It used to open until 6 in the morning, however they have shorten their operating hours to 3AM daily. Other than the delicious beef and pork, check out their grill pork intestines and freshly pickled raw crabs. 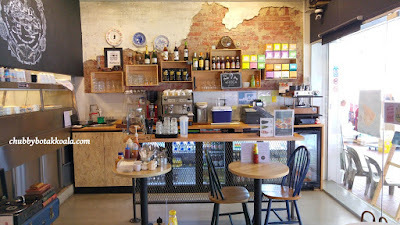 For red meat, (steak place); Simple and unpretentious The Market Grill is a must try. Focus purely on food in a very casual ambiance. If you are seated at the middle section to the end of the restaurant, you can see the grill master at work. Do take note that this place does not take reservation, so you better be early and queue up. Smack in the middle of Orchard Road, we were introduced an awesome place for High Tea, KUVO. While the hustle and bustle of Orchard Road happening below you, you can find serenity and elegance at KUVO. Enjoy your bite size sandwich, cakes or tapas with your tea or coffee. In the evening, prepared to be entertain by head bartender Yutaka Nakashima. Kuvo open till midnight on weekday and 2AM in the weekend, making this place a chill out destination. This year we also made a few special discoveries for Crab Bee Hoon. Opened by Chef Mac Kong, Long Ji served the ultimate crab bee hoon. The thin bee hoon infused with robust crab stock, topped with female Sri-Langkan Crab, fried shallots, pork lard and cilantro. We became a regular here as our friends keep asking us to bring them here. So crab lovers, this place is a must try. MaguroDonya Miuramisakikou Sushi & Dining, provide us with Otorogasm experience. We finally understand why Japanese went all out for this piece of fish. One of the best otoro we ever ate outside Japan. During the dinner, we also learned about Maguro (Blue Fin Tuna) and the sustainable fishing. Meanwhile, we also discover a unique fish and chips shop in the heartland. Murphy's who uses Arrowtooth fish from Canada. The fish provide amazing texture, suitable for Fish and Chips dish. One of the best fish and chips in the heartland. Thank you very much to our readers, Business Owners, Marketing & PR friends for your support in the year 2015. DC Comics Super Heroes Cafe (“DCSH”) at Marina Bay Sands is one of the cafe that are licensed by Warner Bros. Unlike any normal cafe, this place is like a mini museum for DC Comics. Once you enter the cafe, every details of the cafe is basically screams DC comics characters. You have Superman, Batman, Wonder Woman, Green Lantern and The Flash leading the charge. The decorations, the menu, the food even the utensils, have DC Comic characters or their logo on it. So if you are a fan of DC Comics characters, this place definitely a must visit for you. 12 DAYS TO CHRISTMAS, LET'S DO SOMETHING GOOD FOR CHRISTMAS 2015. 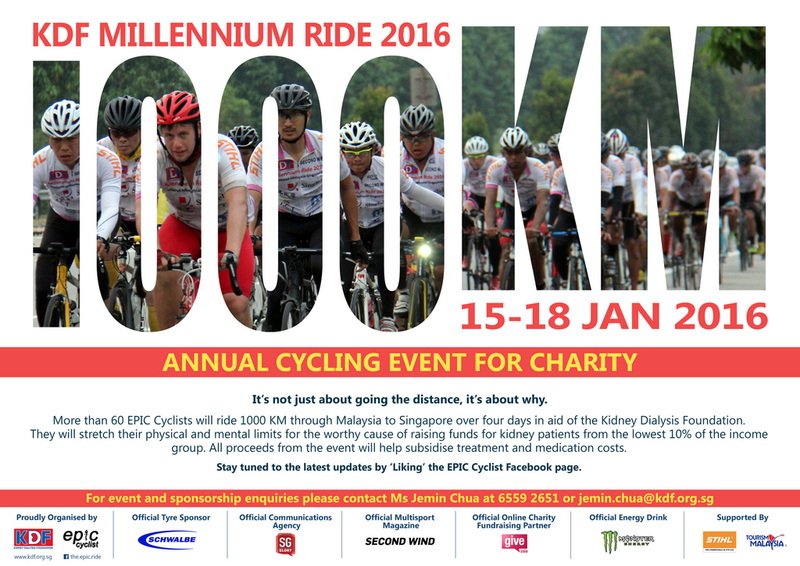 Come 15 – 18 January 2016, Kidney Dialysis Foundation (KDF) will held its annual KDF Millennium Ride 2016 for the 3rd year organised by Epic Cyclists. 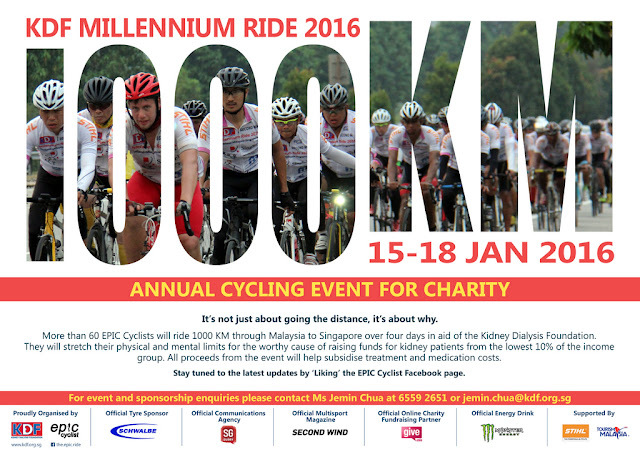 Over 70 cyclists will be participating in the KDF Millennium Ride and riding 1000km in four days to raise funds for the Kidney Dialysis Foundation (KDF). This year Chubby Botak Koala and Little Devil will volunteer as Safety Drivers to somewhat contribute to the welfare of the Epic Cyclists. With this, we hope that to raise more awareness and share the passion and mission of helping KDF patients. Thank you very much for your generous contributions and support. Please pray for us for the success of this event. Joyden Treasures ('JT') is the third eatery opened under Joyden Concepts. While this group has been in the F&B industries for more than 20 years, the Joyden Concepts was launched by the second generation in 2013. It started with the transformation of their seafood restaurant from West Coast Seafood to Joyden Seafood. Followed with the opening of Joyden Canton Kitchen in 2014 at HillV2 and Joyden Treasures at Leisure Park Kallang in October 2015. Each of the establishments has different focus, while JT aim to bring back the nostalgic taste of classic Singapore cuisines. These dishes were long lost either due to the complex and time consuming preparation needed. Besides that, the owners of Joyden also include a selection of their family recipe with a refine touch. 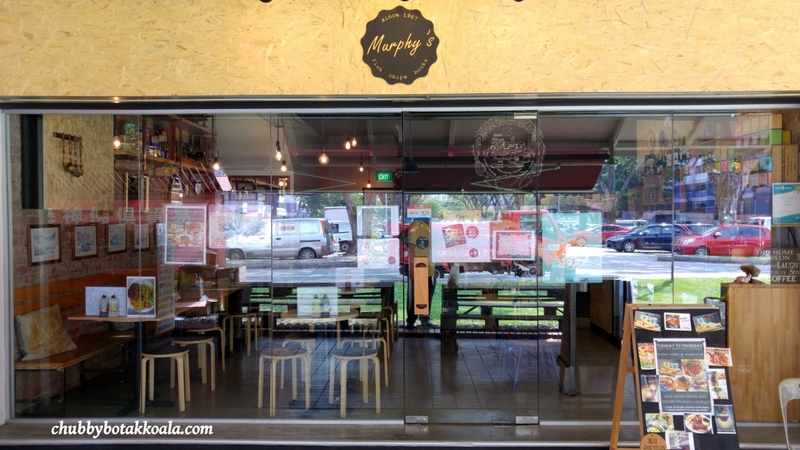 Spicy Thai – Thai Cafe is a home-grown Thai restaurant opened Mr. Ron Poh, a Singaporean who has unexplainable affinity towards everything Thai. Other than serving authentic Thai Cuisine, Spicy Thai also deliver of the authentic way of cooking Thai food, especially in the use of charcoal in soup and steam dishes here. The décor of the restaurant has give you the feel of a traditional restaurant in Thailand. Even with its simple and minimalistic decor, the presence of the Thai offering altars in the centre of restaurant, leave you no doubt that you are in a Thai restaurant.